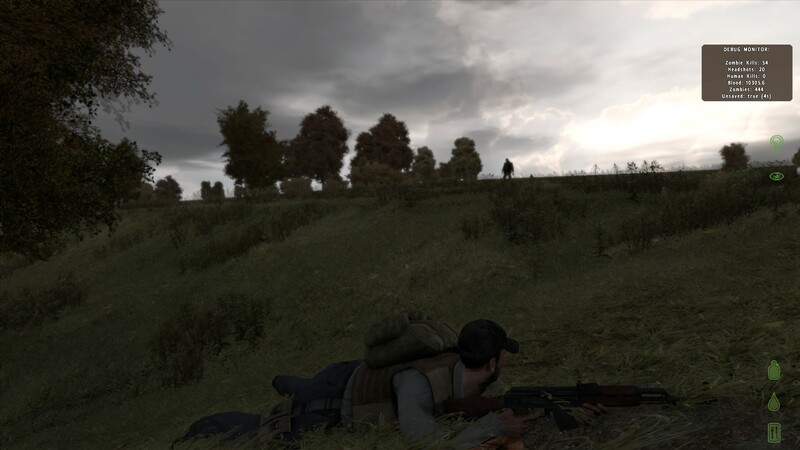 The military simulator franchise ARMA has gathered a modest following since its debut in 2006, and while zombies have been included as enemies in various mods, what hasn’t been done is a full-fledged zombie survival mod. Enter ARMA 2’s Day Z, one of the most ambitious and impressive mods I’ve experienced in a long time for one of the highest selling games on Steam as of the date of posting. Like many others, I was introduced to Day Z through many videos of the mod in action, which alone piqued my interest enough to download and install the mod. Day Z is a multiplayer only, so the experience you get depends on the quality of servers around you. Thankfully, there exists Middle-Eastern servers for those worried of high ping and lag to an unplayable degree, so anyone with a decent PC, internet connection, and ‘ARMA II: Combined Operations’ can take part in the zombie madness. As soon as you begin playing, the first thing you’ll notice is the vague, overwhelming and crude user interface of which there exists no in-game tutorial for. Leaving you to find out that the flashing red cross means “losing blood” at the wrong time, unless you’ve watched a tutorial beforehand. Inventory management, albeit finicky and clunky, showcases one of the game’s main strengths: You spawn with the bare essentials in your inventory and resources need to be scavenged in different cities. This struggle for supplies forms an amazing new dynamic, where people will form gangs or mug other survivors for supplies. In my case, I once encountered what I assumed was a friendly survivor, until I saw a rifle in his hands as he told me over voice chat to drop all of my supplies or he’ll shoot. It was an exhilarating and nerve-wracking experience that I haven’t felt in any game, let alone a mod in a long time! 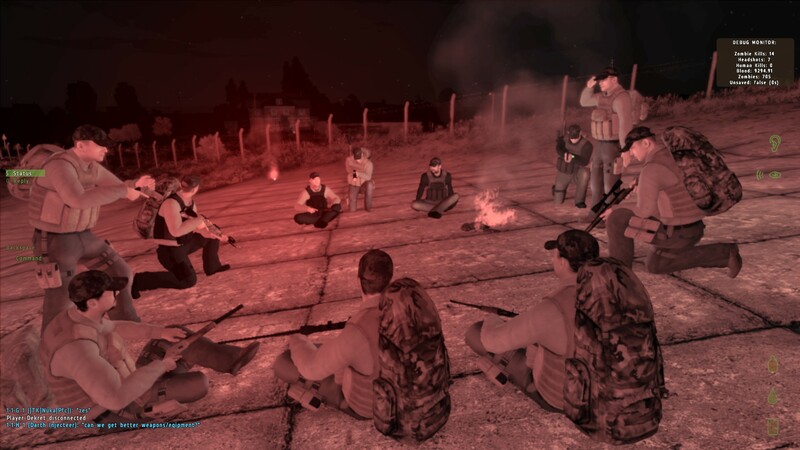 I’ve also heard people forming gangs, disputing over something, betraying each other among many other interesting scenarios that can only be found in Day Z. When worse comes to worst and you need to face the zombie horde, the combat is competent and functional. The amount of hits needed to kill a zombie depends on the type of weapon you are using and what part of the zombie you are shooting. There’s also a noise radius for each gun. Noise radius is important because if the gun has a very wide noise radius, then zombies from around your area will alerted to your presence, a gameplay mechanic handled adequately at best and crudely at worst. Should you want to avoid combat, staying crouched will greatly reduce the chance of zombies spotting you even if you are sprinting while crouched. There’s a wide variety of weapons to find in Day Z such as pistols, rifles, shotguns and various types of explosives, and part of the fun in Day Z is finding a new weapon after walking miles and miles to a nearby city. Speaking of walking, prepare to do a lot of it as you search for supplies and weapons and fight the zombie horde. To the game’s credit, you won’t be bored most of the time while trekking from one city to the other as you may encounter zombies and other survivors to break up the monotony and to encourage caution on your part. The game’s map is large, and should you ever get lost, an in-game map from some areas will help you across the vast Russian landscape, although there exists online maps with guides on where to get supplies. There’s supposedly a van you can find that helps reduce travel time in this vast open-ended world. After seven hours of gameplay, I feel like I only scratched the surface of what’s probably one of the largest and most sophisticated mods I’ve encountered. There is so much more to this mod than just what I discussed, and if you are growing tired of Left 4 Dead or Killing Floor, buy a copy of ARMA 2 and join the Russian zombie apocalypse. On another note, why is it always Russians? 2 Comments on "GO Community – Day Z First Impressions"
day z is so cool / mr dno black ops ?